Another story about stereotypes, in which the word "savage" is also used. A short story about an Egyptian Bedouin family. A different work of graphic fiction from Egypt. This graphic story takes place in the first part of the twentieth century, at a pyramid in Egypt. You'll meet Bedouin tour guides and their British clients—but who are the real "pharaohs"? Copyright by Florent Ruppert and Jéróme Mulot. First published as Les Pharoans d'Egypte. By arrangement with L'Association. Translation copyright 2007 by Edward Gauvin. All rights reserved. Originally appeared in English in Words Without Borders' February 2007 issue: (Worth) Ten Thousand Words: A World of Graphics. Florent Ruppert was born in Troyes in 1979. His publications include the fanzines Le Journal de l'Aventure (2002), Le Journal de l'Aventure diese 2 (2003), and Del Aventure (2004); and the books (all published by L’Association) Safari Monseigneur (2005), La Poubelle de la Place Vendôme (2006), and Panier de Singe (2006), for which he and Jérôme Mulot won the Best Newcomer Award at the 2007 Angoul'me International Comics Festival. His latest book, Barrel of Monkeys, again in collaboration with Jérôme Mulot, was published in 2013. Florent Ruppert (Troyes, 1979) and Jérôme Mulot (Dijon, 1981) have published the fanzines Le Journal de l'Aventure (2002), Le Journal de l'Aventure diese 2 (2003), and Del Aventure (2004), and the books Safari Monseigneur (L'Association, 2005), La Poubelle de la Place Vendôme (L'Association, 2006), and Panier de Singe (L'Association, 2006), for which they won the Best Newcomer Award at the 2007 Angoul'me International Comics Festival. Two-time winner of the John Dryden Translation prize, Edward Gauvin has received fellowships and residencies from PEN America, the NEA, the Fulbright program, the Lannan Foundation, the French Embassy, and Ledig House. His translations include Georges-Olivier Châteaureynaud’s selected stories, A Life on Paper (Small Beer, 2010), winner of the Science Fiction & Fantasy Translation Award, and Jean Ferry's Conductor and Other Tales (Wakefield, 2013), a French-American Foundation Translation Prize finalist. Other translations have appeared in the New York Times, Subtropics, Tin House, Conjunctions, and The Southern Review. The translator of more than 150 graphic novels, he is the contributing editor for Francophone comics at Words without Borders, and a regular columnist on the Francophone fantastic for Weird Fiction Review. Read a young Bedouin tour guide's thoughts on Bedouin history and culture, published on the independent news site Egyptian Streets. Listen to Bedouin songs from the Smithsonian's music collection. 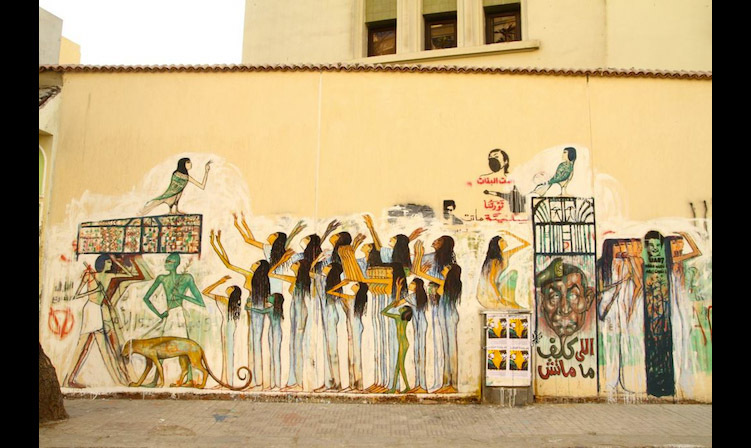 Look at a modern mural that invokes the pharoahs to commemorate people who died during a soccer match—and read about the artist who made it. Listen to Bedouin music from the albums Bedouin Music of Southern Sinai, Rabab: Egyptian Singing and Epic Songs, and the 1957 recording, Arabic and Druse Music—all from the the Smithsonian's music collection. Read Barrel of Monkeys, also by Ruppert and Mulot. Read about a modern encounter between Western tourists and Bedouin guides, from the perspective of the tourist. Take a look at the blog The Bedouin Way, published by two young Bedouins who lead Sinai tours. Read the poem “The Sphinx Speaks," by Francis Saltus Saltus. Read Wordsworth’s poem about the retreat of Napoleon's armies, "By Moscow Self-Devoted to a Blaze." Read Tobias Wolff's In Pharaoh's Army: Memories of the Lost War, a Vietnam memoir. Listen to Dre Murray's song "Pharaoh," about the materialism of “modern day Pharaohs.” Also, read the lyrics. “What do you think, sir, am I a human being or an old shoe?" Read selections from Taxi, Khaled Al Khamissi's nonfiction collection of stories of Cairo's cab drivers—their experiences are, in some ways, similar to those of the tour guides in "The Pharaohs of Egypt." Hamlin Garland's "Do You Fear the Wind?"